Sep 2, 2009 - Who Are We? Rocky Curtiss '62 poses a challenge: "This picture includes some TCHS class of '61 and '62 plus some from other schools. How many can you identify?" OK, I've waited long enough. I see Steve Judy, Danny Adams, ? Calvert, R. Curtiss, Lorrie Gardner and several others I recognize but cannot name. Isn't that one of the Elder boys in the front row, with glasses? There are other familiar faces but I'd have to dig out my yearbooks to - maybe - identify them. It's a Little League All-Star team, whose constituent teams played at Emperor. The venue is Emperor School, ca. 1956/7. For about 2.5 years the elementaries ran K-8 while TCHS was under construction. That tree (the only one on the playfield) stood only a few feet outside the third base line, and there was a ground rule about balls going into it. More than one spectator got an unpleasant surprise from a line drive foul. 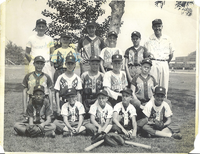 It is the Sunnyslope Little League All Star team of 1956 which now plays at its permanent facilitiy on the corner of Muscatel and Broadway (I think). The players are: Back Row L-R: Vern MacDonald (mgr) Bobby Jones (went of SGHS) Jeremy Johnson (went to LaSalle) Steve Judy, then two people I do not remember; Middle Row L-R: ?, Jim Gressinger, ?, Allen Macdonald (SGHS), Danny Adams; Front Row L-R: Eddie Calvert, Lorrie Gardner, (me) Rocky Curtiss, Gary Langdale, and Ray Sparling (SGHS). That's the best I can tell you.